When I’m in a certain mood, I like to entertain myself with the – totally predictable – comment threads under YouTube videos. (When I’m not in this particular mood I don’t bother reading the comments.) One of my favorite recurring comment topics is the one where people argue in connection with a song made famous by a movie, book or PC game whether the right to enjoy and love these songs is (should be) granted even to those poor unfortunates who only learned about the particular song through the movie, book or PC game, or only to those lucky souls who already knew the song before it became famous, and were therefore in the know of a secret and unique source of pleasure which will now be spoiled by all those hordes of newcomers. A while ago I was reading a comment thread about this topic in connection with a song I – by chance – happened to already know and love. The name Charlie and references to a sense of infinity kept recurring in the comments, and I had no idea who this Charlie was and what the conversation was about. Anyway, I became interested in a book in which someone listens to or mentions „Daydream” by The Smashing Pumpkins, so I looked up the novel and read it. And I’m glad I did because this is good novel. It’s a teenage novel / coming-of-age story (which is one of my all-time favorite genres), and fortunately it’s the regular kind of teenage novel, by which I mean that it has nothing to do with the young adult genre (I’m yet to read a YA novel which is good, and not a cheap and dishonest self-help book for teens – any recommendations would be more than welcome). The narrator-protagonist is 15-year-old Charlie who’s just starting high-school, and the book is about his first year as a high-school student. We learn the events from the letters Charlie sends to an unknown friend throughout the year. He doesn’t expect an answer, he only wants to talk, and he does talk, about everything: his nuclear and extended family; his aunt Helen, who died when he was seven, and for whose death he partially blames himself; his school friends whom he loves more than anybody or anything else; the first kiss, date, cigarette, LSD trip; his English teacher, who notices a special talent in him and assigns him extra books to read during the school year (and good books at that – such as On the Road, The Great Gatsby or Walden); and about everything else. Charlie is an excellent storyteller. Not only does he describe the events themselves with great power and perception (yet in a very simple and honest way), but he can depict all the „teenage-emotions” behind them: the fear; the insecurity; the angst; the „screwed-upness”; the hope; the curiosity; the lust for life; the excitement of all kinds of „first things”; the serenity; the unworldliness; the feeling of the world and you being one, and the feeling of the world and you being mutually exclusive. Not surprisingly, this novel – as every teenage novel I know – has been compared to The Catcher in the Rye, and in this case the comparison is apt, this novel is worthy of the honor of being mentioned together with Salinger’s masterpiece (if you haven’t guessed this by now, let me add that The Catcher in the Rye is my greatest favorite). Of course there are some differences: this novel is way more concrete, practical and over-explained than The Catcher in the Rye (at some points, especially in the epilogue it almost feels like a self-help book for teens), and my assumption is that it won’t become such a timeless book. 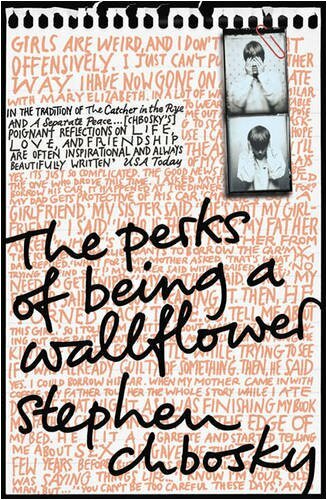 The Perks of Being a Wallflower came out in 1999, and the story is set in 1992, and it definitely has a strong 1990s atmosphere to it, it is deeply rooted in that decade, and I feel that 50 years from now – if it’s still read then – this sense will be even more striking, and the book will probably feel dated. But now it is really a great book.